There’s a difference in direct between strategies for collecting direct mail lists and email lists. Because marketing is moving more and more to the online sector, it’s no wonder businesses are climbing all over each other to get the best email lists. As a real estate investor, you should be learning how to build the perfect email marketing list so that your business won’t be limited to just bandit signs and postcards. First of all, why should you bother with growing your email marketing list? Good question, dear reader! As a real estate investor, you’re not only in the business of buying houses. If you’re truly a successful real estate investor, you know that there will be properties that you’ll need to wholesale, or birddog, or need to buy from other investors. With that knowledge, you understand that staying in communication with other investors is key to keeping your properties fresh. And, that since we’re not in the 1800’s, email is the best way to do just that. I mean, who doesn’t check their email at least 5 times a day? 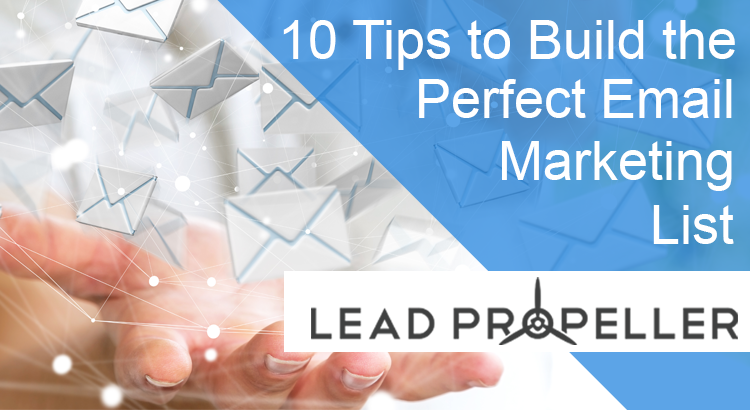 Let’s go through these top 10 tips to build the perfect email marketing list for your real estate investing business so that you can grow your networking and buyers lists. If you’ve got a LeadPropeller website, then you don’t have to worry about this one. There’s an opt-in right there, already built, on your front page. In fact, it’s the first thing visitors will see when they go to your site. Regardless of if your site is targeting wholesalers, motivated sellers, or just general investors, we’ve got you covered. 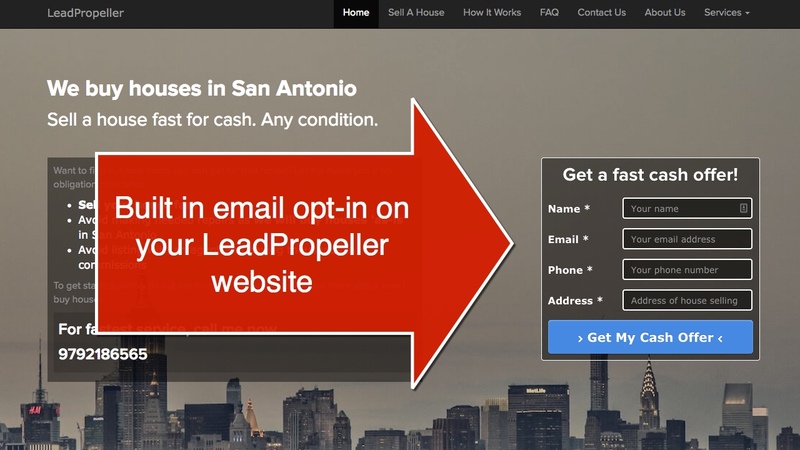 If you don’t have a LeadPropeller website for your real estate investing business, then you need to have an opt-in feature predominately located for visitors to engage with. An opt-in can be something as simple as a box, a subscription log-in, or a message board. The point of this is to entice website visitors to leave their contact information with you. If you’re targeting motivated sellers, you can contact them right away and then save their email to retarget them later. If you’re targeting wholesalers, then their contact information should be added to your lists so that the two of you can network in the future. Again, if you’ve got a LeadPropeller website then you also have a blog that is easy to install. We won’t bore you with the details, but when you install your LeadPropeller blog you also have the option to get Content Packs. These Content Packs are scheduled to publish one a week, and are already optimized for your business and local area. So, once you install your blog and Content Pack, you’re good to go! All of these Content Packs have call to actions built into them so that you can collect more emails. If you don’t have a LeadPropeller website and blog, then you’ll need to build one. Actually getting your blog up and running isn’t too bad, but maintaining it can take a while. Most people who start blogging online will get a WordPress blog to add to their website, but there are other options out there. Of course, no matter what blog style you go with you should always have a call to action in the articles that leads them to your email submission. After all, we are trying to build the perfect email marketing list for your business, what good would an article do if it didn’t get you more emails? Social media is an insanely fast growing way to get your real estate investing business exposure. In fact, Facebook alone has 2 billion + monthly users! The more people use a social network, the more you should be promoting your business on it. One of the best social media strategies to build the perfect email marketing list is by using the built-in post features some platforms already have. For example, Facebook’s business pages give you a button that appears at the top right of your page. This button can be linked to any page on your website. To collect more emails for your marketing lists, label the button “contact us” and link it to your email collection form! 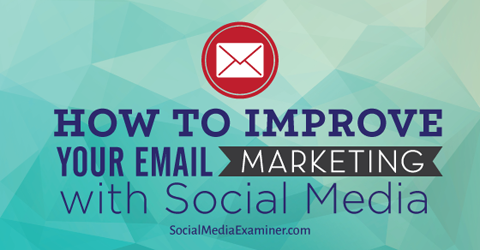 For other social medias, be sure you’re posting a link to where you collect emails from at least once a day. The more you post, the more people it will get in front of, and the more people will interact with it! Collaborate on a post: This is where you and the other investor work together either on a video, podcast episode, blog post, or social media event. When the two of you collaborate on something, always be sure to provide plenty of ways for the audience to leave their email information with you. Have links to your sign-up pages. Remember, the point of this is to build your email marketing list. Gust post: This is where you create the content (either a blog post, video, podcast episode, or social media event). Then, the other investor you’re working with will post your content directly to their platforms. That way, you’re getting the exposure of their audience. As long as you’ve built in an opt-in, or call to action, then you’ll be collecting emails in no time! Remember how we said that Facebook alone has over 2 billion monthly users? That’s an example of an outstanding online community. Now, don’t get any big ideas, you’re not setting out to create the next Facebook. However, you can use social platforms like Facebook, Twitter, and Bigger Pockets to create groups for other real estate investors to join. 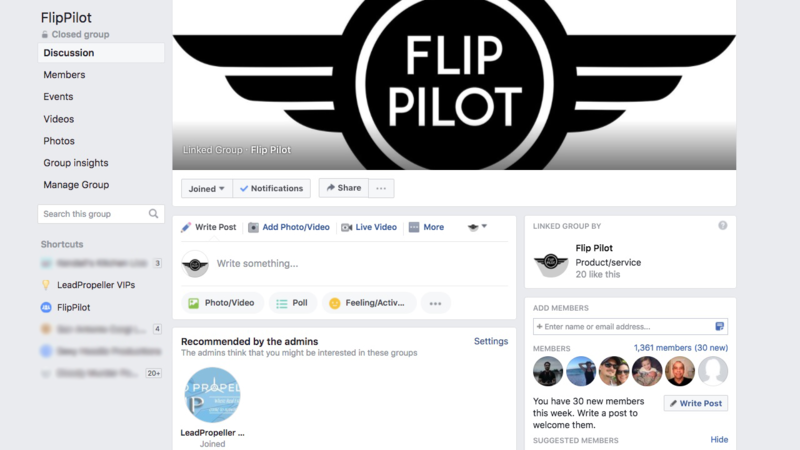 Take the Flip Pilot Facebook group for example. This is an online community where other active real estate investors come to network, share ideas, and get insider information. This group is constantly growing because it engages with the target audience. And, in the group’s information, there’s a link to the website where emails are collected. Making your own Facebook group is simple. After you’ve spend the 5 minutes it takes to make it, now it’s all about getting the word out. This will give other real estate investors an incentive to leave their email information with you. Just like your business cards, your direct mail pieces should include an opt-in URL for motivated sellers to visit. When they get your postcards, every piece of contact information should be there. Just like your business cards, though, there should be an enticing reason for them to leave their email information with you. This strategy will work best for B2B style communication (you know, between you and other investors). If you’re looking to build the perfect email marketing list for your wholesaling business, then add offers to make it a win-win for you and the other investors. Let them know that when they leave their email information with you, they will get exclusive first looks at your properties before other investors who aren’t on your email list. This will drive up the value of leaving their information with you, and grow your email marketing list! We’ve talked about how useful testimonials are for building your real estate investing business’s brand and message. On your business’s website, you should be featuring video testimonials to drive your engagement rates. At the end of those videos, though, you also need to include a title card with your email submission information. Preferably, you should also have a pop-up at the end of the videos with a direct opt-in spot for viewers to leave their email information with you. It’s no secret that we’re going to promote the built-in features with a LeadPropeller website. I mean, look at the blog you’re on, this was bound to happen. As we stated in some of the tips, you don’t have to worry about doing it yourself when your LeadPropeller website already has these features ready for your real estate investing business. Our front pages are optimized for email collection with a high converting opt-in panel. You can build as many landing pages as you want, and customize them with the same simple to use editor as your website. Honestly, it’s kind of a no-brainer to be using a website that has all of this ready to go live in just 15 minutes. In addition to our killer websites – if we do say so ourselves – we also have top of the line online, managed online marketing services for your real estate investing business. Don’t spend all of your time in front of a computer getting emails, let that be a part of your managed pay per click service! Build your business’s online presence with no hassle with our professionally managed search engine optimized service as well! The opportunity for your real estate investing business to grow are waiting for you, you just have to take it. 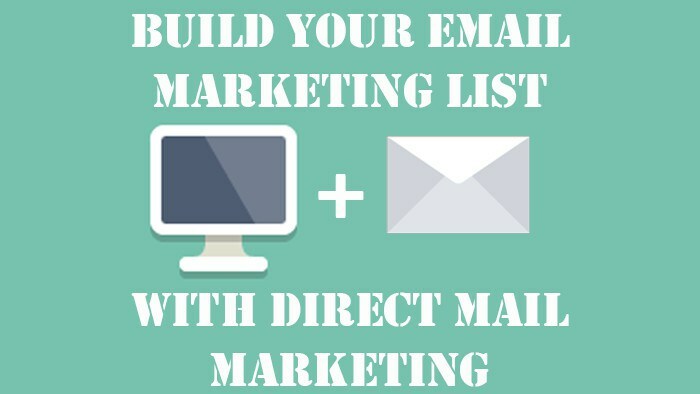 Go Build the Perfect Email Marketing List! Now that you have the best strategy to build the perfect email marketing list for your real estate investing business, you’ll be expanding in no time. What are you waiting for, get out there and get more emails for your marketing campaigns!